After my attempt at improving the concentric circles, Stephen Few was kind enough to provide more feedback: he still doesn't like them. Your experiments with concentric circles are interesting and it's clear that you're having fun exploring this, but the new version doesn't seem to work any better than the first, even though you've eliminated the one annoying illusion. We're still left trying to compare areas, and even though inner circles make this slightly easier, the comparison still requires too much effort and time. Also, to my eyes the patterns formed by the concentric circles are hard to look at--similar to targets on a gun range--which make me a bit dizzy. I appreciate your efforts to find a better solution, but I doubt that concentric circles will prove useful. The concentric circles don't make me dizzy, but I agree with the core of the arguments. If the goal was to equal bricks in ease-of-reading, then yes it is a failed attempt. 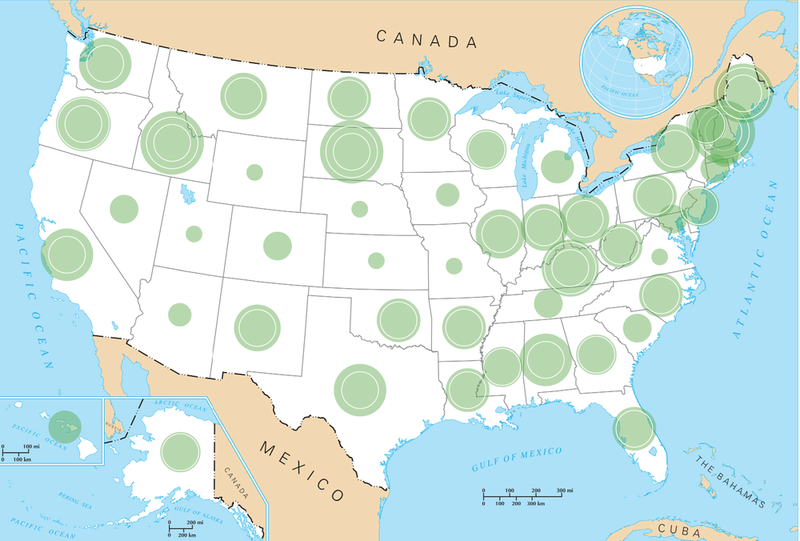 But if the goal was to improve on plain shapes and colors to display quantities on a map, then it seem like a fair addition to the data visualization arsenal. Circles exist and are regularly used on maps and this is a suggestion to make them a little more precise. I made a few more tweaks to the concentric circles. Here is version 3. I am starting to think that they should have been called "circular gridlines" ever since I replaced the circumferences with colored the area. The smallest circle has disappeared because the spacing was not constant: the small circle represented 1 unit; the next circle, 5 units; and the third, 10 units (1-5-10...). Now the interval is constant at 5 units (0-5-10-15). The result makes clear that the area grows much faster than the radius. I double and triple checked my numbers, but it seems that the inner circle is really the same area as each of the two rings. Truly, these areas are counter-intuitive. I now use white gridlines with the vague hope that they will be less dizzying, if that is truly a problem. The downside is that we can't see when the value reaches a multiple of 5 units, like with the faint grey gridline, only when it exceeds it. That's why I have a third row in the example above, to show more than one gridline at work. One is not limited to intervals of 5, of course, and a different interval would certainly work better in some cases. Time to put the version 3 on a map and compare with the plain circles. Click for full size. So, which one seems clearer? For testing purposes, compare Texas and Louisiana. Washington and Oregon. Oklahoma and New Mexico. In these cases, the circular gridlines help me establish which one is largest, something I can't quite do with the plain circles. Stephen Few has very high standards, which I respect and wish I could meet, and he wrote that he will not endorse a method that uses area to encode data. Still, this is not about getting his coveted approval, but contributing to and engaging with the larger data visualization community. I would be interested to hear what you think and to see the result if some of you ever test the concentric circles on a real project. Note: This is a screenshot of the original poll. It is no longer active now that we moved web platform. Thanks for exploring the possibilities of concentric circles. Unfortunately, as you've seen, when there are more than three or four concentric circles, we cannot perceive the quantities by subitizing; we must attentively count them, which is very difficult to do because they are close to one another and hard to differentiate. Even with attention, it is very difficult to see the difference between a set of seven vs. a set of eight, and so on. Also, notice that sets of closely packed concentric circles beyond a small number create an annoying visual illusion of partially overlapping circles at the four cardinal positions (top, bottom, left, and right). You can see this especially in your map example. Even though this doesn't work, it was definitely worthwhile to make the attempt. Thanks for the contribution. This is fair criticism, so I went back to the drawing board. My goal is not to match or exceed the bricks, which I think do a fine job on the preattentive side, but rather to improve on the circles to convey quantities on a map. These were my challenges. Get rid of the optical illusion. Preserve the capacity to overlap. Make the quantities easier to perceive. Here are the concentric circles version 2.0. The colors is now on the area instead of the stroke and there is a circular gridline every 5 units. This design is less busy and does not create the optical illusion of version 1 at smaller sizes and lower resolutions. The concentric circles can still overlap and preserve their shape. And the circular gridline allows to see when certain thresholds are crossed on the circle, something that is not possible on a plain circle. It is not possible to interpolate precisely between gridlines. 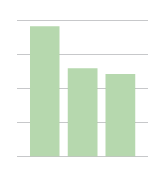 Columns and bar charts suffer from a similar problem, but they hold two advantages. The first is that they generally have a gridline that exceeds the length of the longest column or bar. The concentric circles 2.0 could do the same thing. I don't want to discard this solution entirely, but I am concerned that we will perceive the outer limit more than their colored area and overestimate the size of the circles. The cost seems to outweigh the benefit. The second advantage of the bar is that the distance between the gridlines is constant. In a circle, it is well-known, the distance between the circumferences of concentric circles with areas of equal intervals gets smaller as they area grows. It is unlikely that people will adjust their perception of the distance and scale between each circular gridline. I am not sure how much of a problem this is, considering that we are not aiming for the precision of a table, but rather for a visual method that allows a fair approximation. Still, the approximation is likely inferior to that of the column and bar charts. The contribution of the concentric circles is that they make this confusing property of areas visible, while the plain circles do not. 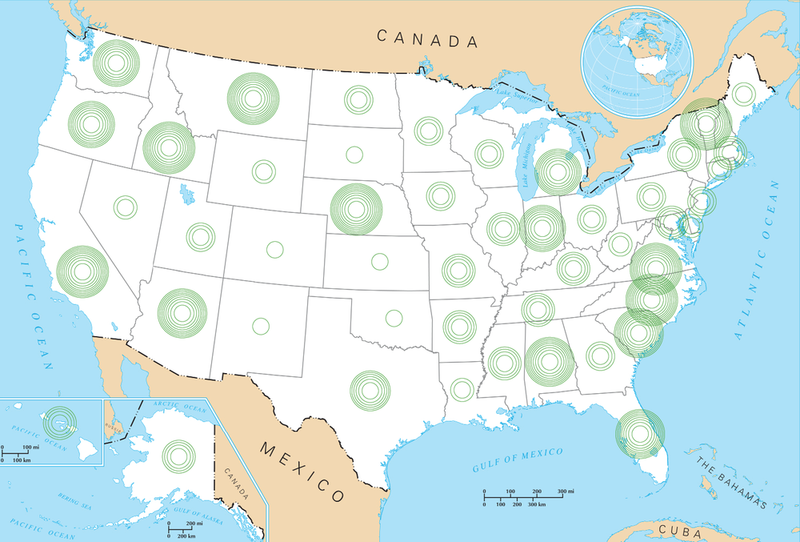 Enough parading, time to put the concentric circles at work on a map. Click for real size. Compare with the plain circles. 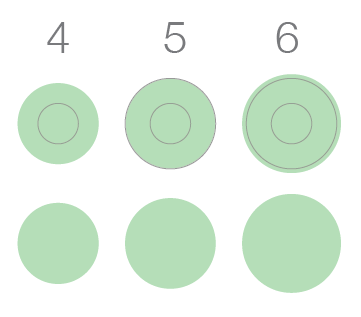 So, is it easier to visually estimate quantities with the concentric circles? The slight difference between Arizona and California seems more visible with the concentric circles, and easier to perceive than with version 1.0. The difference between Oklahoma and Louisiana, at least to my eye, is perceptible with the concentric circles, but barely with the plain circles. Click below to see some other experiments that I discarded or keep for later versions. The first one was inspired by a suggestion from Taimur Sajid on Twitter and it put me on the scent for the version 2.0 (thanks!). I find it too busy though and prone to the optical illusion and difficulties of counting rings. The gradient was too hard to test at different sizes (!). The other three are still too busy. There are still two options that hold potential however. The shades replace or complement the circular gridlines. I ran out of time today to test them. I am concerned, however, that the shading will interfere with the transparency when circles overlap. Still, it could either reinforce the visual encoding for quantities, or simplify the design in the case of the one without strokes. Finally, I used many of the default settings of my software. There's more to try with different colors both for the area and for the strokes to make the concentric circles clearer. I look forward to the discussion, hoping to see more people weigh in because there is much to gain from a clearer depiction of quantities on a map or with areas in general. Stephen Few introduced "bricks" a few days ago as a new way to display quantities on a map. Using circles is tricky because humans are not skilled at distinguishing areas. Few suggests that we can distinguish the shape of the bricks arrangement and hence count them more easily ("preattentively"). The problem arises when bricks overlap, as demonstrated by Andy Cotgreave, from Tableau, and acknowledged by Stephen Few. Few invited - challenged - his readers to build on his proposal, so I would like to add concentric circles to the discussion. It seems to me that the main issue with plain circles, the one that Few is addressing with bricks, is that they barely send a signal when they grow. A circle representing 8 units looks a lot like one representing 7 or 9 units. Bricks on the other hand adopt a new shape, so it is very easy to see the difference. Concentric circles do not go as far as bricks to show each unit, but they convey it more clearly than plain circles. In the example above, each increase of one unit translates into one more concentric circle. Much like the plain circles, the concentric circles convey quantity by their size, adding to it the number of circles and the aspect of the outer rings. As the area grows in a linear fashion, the corresponding increase in radius diminishes and the circumference grows denser. The advantage over bricks is that concentric circles can overlap and keep their identity. Putting them on a map shows how their size and appearance combine to convey quantities. For instance, to my eye at least, California seems a little bigger than Arizona and, indeed, it is by 1 unit (click on map for real size). A clearer example would be Colorado and Wyoming, where the 1 unit difference is unmistakable. Concentric circles have their downsides. Above 5 circles, it is very difficult to count them. It is unlikely that a reader would rely on this method to compare quantities precisely. The stroke can become problematic at greater sizes, when the difference between the circles is very small. The visual is more complex than plain circles. This may create issues especially when interacting with certain backgrounds. The distinction between sizes is less clear than bricks. Testing might tell us if it is any better than plain circles. I have made some quick tests with variations in colors and full circles with white strokes. Neither seem to work as well as empty circles with colored strokes. It might well be that this method is already well-known, although a quick search did not yield results. I'd welcome any pointer to anterior examples. It might also be that this method is adding less than it takes away. In any case, I thought I would add one more idea to this interesting discussion started by Stephen Few. I really want to know the source of this brilliant caricature. PowerPoint is so despised that "death by PowerPoint" has become a common expression. It might be more literal than you think given its role in the explosion of the Columbia shuttle and its negative impact on the conduct of war. Even the creators of PowerPoint don't like how it's used today. Yet PowerPoint has its defenders. Many argue that users can build good presentations with it if they know how to use it properly. It is designed to create bad presentations by default. If PowerPoint were a car. If PowerPoint were a coffee mug. That is, to create a good presentation, you have to avoid the pitfalls that PowerPoint puts in your way. For people who are so sensitive to design, I am surprised that presentation professionals do not level this criticism more often at PowerPoint. They know that a presentation design helps the audience understand the right messages. It is Microsoft's job to design PowerPoint so that users will stumble upon good presentation practices. Let's go through a few basic features of the PowerPoint interface (2011, the latest for Mac) and how it contradicts professional advice on how to make good presentations. I'll even make some constructive suggestions. Click on the familiar red icon and you'll get this welcome screen. It invites you to type the title of your presentation, as if you knew at the beginning. It also makes you feel inadequate if you don't have a subtitle. Can you imagine Word starting by telling you what part of your text you need and should write first? Solution: Present an interface that encourages the user to develop their story first. Unfortunately, PowerPoint has become the first thing that people open when they have a presentation to prepare. Deal with it. Instead of starting with a slide, what about starting with some story-making interface where people would be able to note down their points and rearrange them, like post-its? In the meantime, make the speaker's notes section much more prominent so that users write down all that crosses their mind there, rather than in their slides. Choice paralysis? You might be a good presenter. The very first icon in the very first ribbon encourages you to add slides and to choose layout options for them. Let's look for one of the best options: a full screen picture. There? No. There? Nope. Hum. There? Non. Oh well: It doesn't exist. Solution: Check out the layout options of the Apple Aperture photo albums. They look like good presentations by masters like Garr Reynolds. Full size images, big titles. 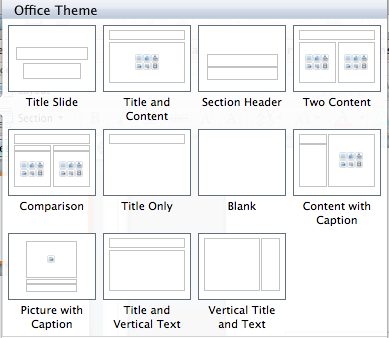 Why is it that PowerPoint does not have a single such layout? The bullet points! The dreaded, overused bullet points, the staple of lists without hierarchy, of paragraphs to read while a speaker speaks, of half-formed ideas on printed decks -- it's what PowerPoint suggests you should be using in its bread-and-butter slide. It gets worse: when entering text, hit tab and you go down one level, with a random choice of "em dash" as the next thing after "round bullet" (who died and made the round bullet king?) and... reduces text size! Take that, large and sparse text. Hey user, why don't you just fix that yourself since we all know it's bad form anyway? Solution: Do not put bullet by defaults. If a user needs them, they are at the exact same place as in Word. Make users work just a little for doing the wrong thing. A well-known hierarchy: dot, dash, dot, dash, French quotation mark. 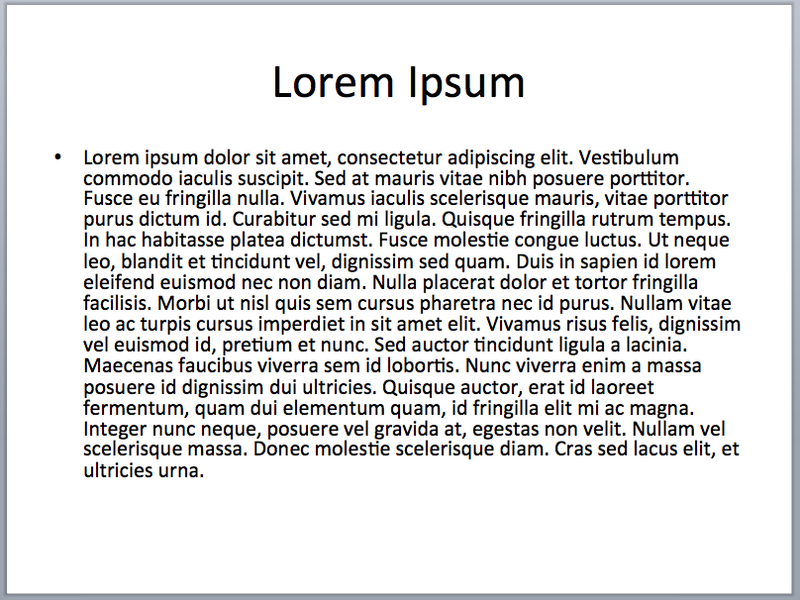 PowerPoint gets you started with a fairly large text size: 32 points. Good: this is in line with the advice to limit the amount of text on your slides. But what happens when you write more than a text box can contain? PowerPoint takes no offense, in fact it takes care of the problem by automatically reducing the size of your text! How is that supportive of restraining the number of words on a slide? How is this not a temptation, a signal to the user that there's no point in limiting the amount of text? That's the source of the slideument, right there. Solution: No more text auto-resize. When a user puts too much text on a slide, it should have to manually override the software. Which of these themes look good to you? Maybe better not to answer. Microsoft ran a competition to find the ugliest themes possible. Is there another explanation? (Would "Couture" mind getting out of the way please so that we can add some content?) Maybe they asked their software engineers to design the themes. Or Steve Ballmer. Solution: Include elegant, restrained but also relevant themes. Call the black and white one "Brightly lit room". This might even suggest to the user that a good presenter knows in advance what the room looks like. PowerPoint is a visual aid, so this has to be good. Kudos to Microsoft: nearly half of their layout options propose a direct link to pictures. And double kudos because it links to your own photo library, which might not look professional but are surely original. On the other hand, there is no link to a professional photography website, such as Corbis or iStockPhoto. There is, however, a link to their breathtaking (as in "taking the life out of you") clip arts. Seeing a Microsoft clip art in a presentation has become a reminder that you're not following your dreams. Solution: Give good habits to your users and offer access to 20 free photos with each copy of MS Office, in partnership with a professional photo company. Heck, Microsoft, Bill Gates owns Corbis. Hint, hint! Help me choose between the bomb and the hourglass! 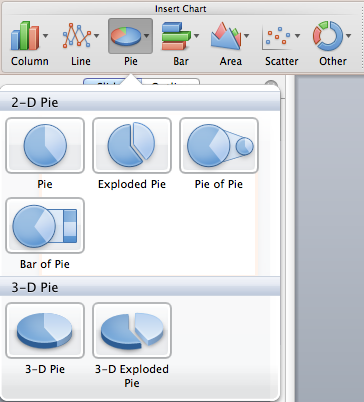 PowerPoint uses the Excel charts and all Excel defaults are wrong. It glorifies the pie chart and proposes 3D versions of just about every chart. Fixing Excel charts can be a full time job and a profitable one at that. How can we blame the casual users for using the most accessible designs? Solution: Fix Excel charts. The 2013 version seems like a step in the right direction, although I haven't used it. But that's for another post. MS Word has not corrupted writing. Maybe it has to do with a blank page and a series of fairly relevant tools. If Word was designed like PowerPoint, the text would be all caps by default, the first page would ask you the title of your book and you'd have three bullets waiting for you. Let's not defend a bad tool. Let's ask Microsoft for a tool with the right affordances. The interaction of users and their tools is critical to the outcome. Audiences deserve better than the duo amateur-PowerPoint. Jorge Cameos blogs about pie charts over at ExcelCharts.com. He doesn't like them. 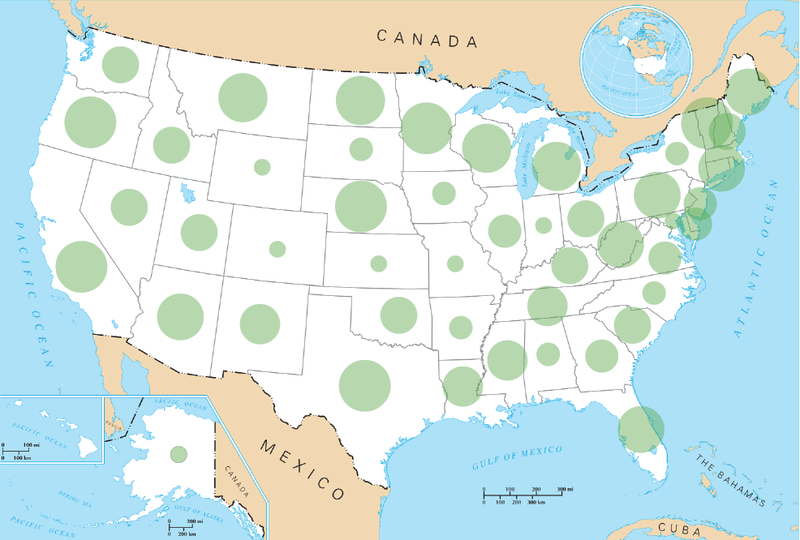 Indeed, pie charts do not get much love in the data visualization community, as popular as they are outside of it. I'm fascinated by this discrepancy, trying to understand if it yields from ignorance, naivete, instinct, snobbery, expertise, science, else or all of it. I need to: I work in an environment where they receive much love and I don't like them very much. Jorge's point is that pie charts are not good to make comparisons beyond one category against a whole. Have a look, he makes a compelling case. I especially agree with the problems of comparing data points across pie charts. Still, here I come in defense of pie chart's capacity to compare more than two categories (I agree with Mark Stacey that it's more accurate than saying "one" category). A pie chart can allow you to compare the proportion of one category against another or a group of other categories. Here is an example. A pie chart with four categories. The trick is to group the other categories to make one stand out. We still compare ice cream against the whole of children's favorite desserts, but we add information that the rest is divided in many portions. It seems better than grouping them under an "Other" category. Using one color, with dividers, is sufficient. It is not the place to compare other desserts amongst themselves, of course. My point does not go against that of Jorge. It remains one category against a whole. But I thought that this nuance (and this field is full of nuances!) could help people think about using pie charts and not automatically exclude them when they have more than two categories of data. Try isolating the one you want to highlight and visually group the others. 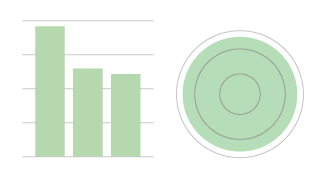 Because we can visually estimate quarters and halves, pie charts are good to show when we reach certain thresholds, such as when a plurality becomes a majority, in ways that bar charts are not. Notice how I don't even need to write percentages on the chart and yet, you know ice cream is a little above 50%. In many data sets where plurality and majority are important - think of electoral politics or demographics for instance - this can be useful.